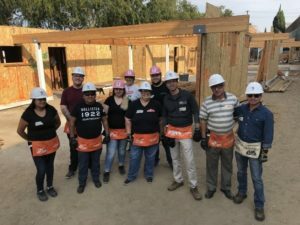 Volunteering franchisees and employees from locally owned and operated Papa John’s stores in the greater Los Angeles area teamed up with Habitat for Humanity of Greater Los Angeles (Habitat LA) to sponsor a build day. Fifteen Papa John’s team members joined Habitat LA volunteers and spent the day on site at the new 10-home Habitat LA build project in Culver City. After a quick orientation to get the Papa John’s volunteers familiar with the site, participants went straight to work where they were taught skills from cutting wood with a table saw, and using other power tools, to securing the structural elements of the frame. This sponsorship is one of many that Papa John’s Southern California is actively involved with, in an effort to support organizations giving back and doing important work in the greater Los Angeles community. This initiative was especially important to Papa John’s because of Habitat LA’s dedication to serving families throughout Los Angeles. Partnering with very low-income families to build or rehabilitate homes is the hallmark of Habitat for Humanity’s successful approach to eliminating poverty housing one house at a time. Habitat for Humanity of Greater Los Angeles has been able to accomplish a great deal, thanks to the support of our volunteers, such as Papa John’s, and donors. Note: Habitat for Humanity of Greater Los Angeles is a registered 501(C)(3) non-profit organization.